As the Corvus Cluster calendar is linked with the “real” calendar, we can say good-bye to 735.M41. The past year has seen war rage across two worlds in the Sculptor System, as well as in surrounding space. Many battles have been fought, but no one has gained any real advantage. Elsewhere, in a region of space where the Emperor’s light does not shine, the Tau recently launched a new military campaign in the Al’gel System. Two years ago, an ork Rok crashed onto Hegira (fourth moon of Sculptor II) and. the ork invaders spread across the southern continent, killing and enslaving the citizenry and converting Imperial manufactorums into war factories for the invaders. Initially unable to stem the xeno invasion, Imperial authorities eventually created a credible defense by mobilizing the Planetary Defense Force, raising new civilian militias, and entrenching the few routes for invasion into the northern half of the moon. Since the beginning of this past year, six major battles have been fought on Hegira, starting with Border Clash on Veris Island (3 002 735.M41). The island, one of many on the Byrgius Sea, was invaded by the ork warlord, the self-styled “Kapitan” Rumlar, who led the assault from inside a Killa Kan.
After this initial foray into the northern “continent” of Hegira, a rival ork commander delivered the coup de grace to Imperial Forces defending the island. In a battle fought 3 016 735.M41, orks drove the Hegira PDF off the island and consolidated their hold on what threatens to serve as an important staging ground for a northern invasion (Fall of Veris Island). This latter battle also was infamous for the battlefield execution for cowardice of the PDF commander by Commissar-Major Rael Dracos. Since then, the apparently unstoppable ork invasion has stalled. 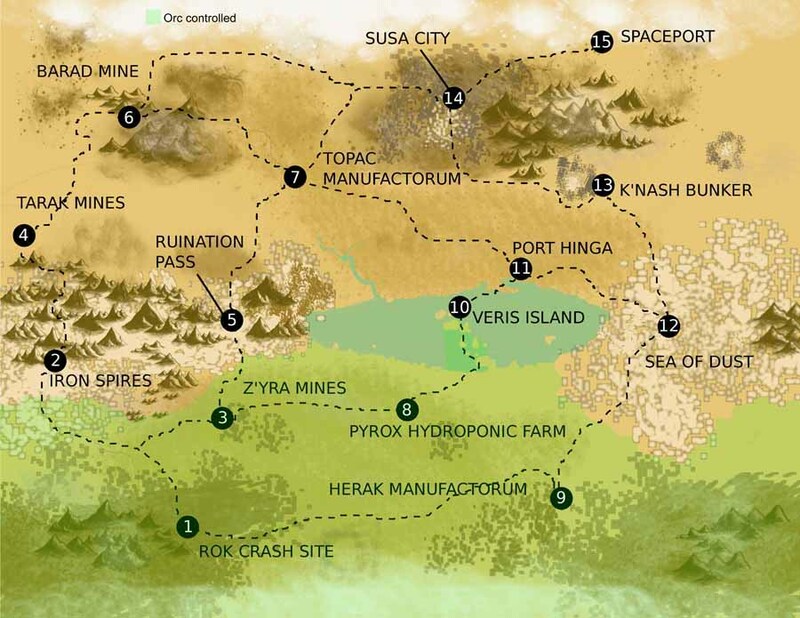 The orks seized the Iron Spires, the largest mountain range on Hegira and a prime launching pad for an invasion north, in what became known as the Battle of the Iron Spires on 3 027 735.M41. A subsequent Imperial counterattack spread over two days of battle (Imperial Guard fails to retake Iron Spires) on 3 042-043 735.M41, was a disappointing failure for the Imperium but delayed subsequent ork attacks. 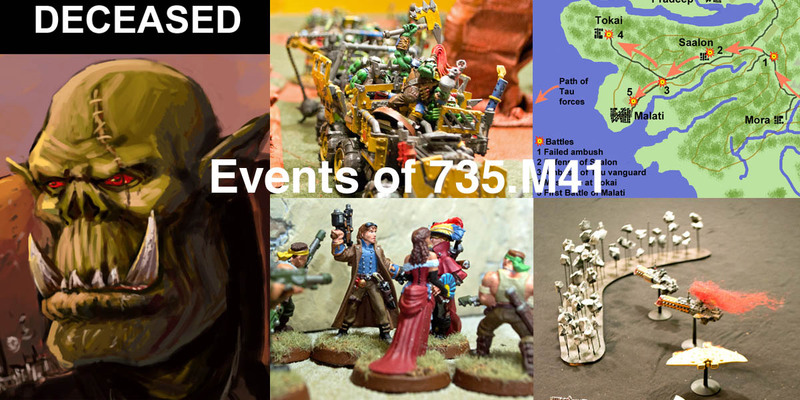 However, after additional reinforcements were brought to the front (728th Cadian Regiment reinforces Hegira Defenses), Imperial forces launched yet another attack (Imperial Guard retakes Iron Spires) on 3 473 735.M41 and eventually regained control of the region. Finally, on 3 842.735.M41, the Imperium made its first—albeit unsuccessful—attempt to retake Imperial territory from the ork invaders. The Battle for the Z’yra Mines proved a bloody fight of attrition, and while the Imperial Guard held the battlefield at the end of the day, their casualties were so great that they lacked the manpower to hold onto their prize. They reluctantly withdrew north the next day. 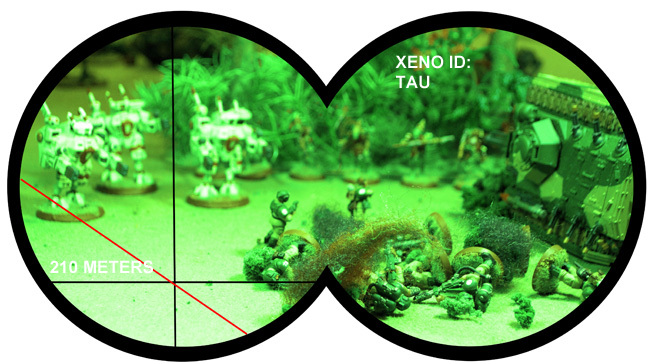 Long-range scanners reveal the slaughter of Imperial Guard by Tau Crisis Suits during the Battle of the White Tower. To the consternation of Imperial authorities, it was learned earlier this year that the Tau had deployed military forces on Dar Sai, the second satellite of Sculptor III. The xeno intrusion was not entirely surprising, given that the government of Media III, a sister moon of Dar Sai, had turned traitor three years earlier and sworn allegiance to the Tau Empire. This successful rebellion had been followed by disturbing reports of Tau diplomats preaching rebellion in rural areas of Dar Sai. The Tau military presence was confirmed in early 735.M41 when Imperial authorities identified Tau troops deployed in the Hanui Valley, a fertile agricultural region in the center of the moon’s largest continent. Soon after, elements of the 728th Cadian Regiment, under the command of Captain Stevrous Stark, entered the Hanui Valley in strength and attacked a similarly sized Tau force near an abandoned manufactorum. What became known as the Battle of the Manufactorum on 3 023 735.M41 resulted in a resounding Imperial success, and Captain Stevrous Stark won great acclaim for his victory. 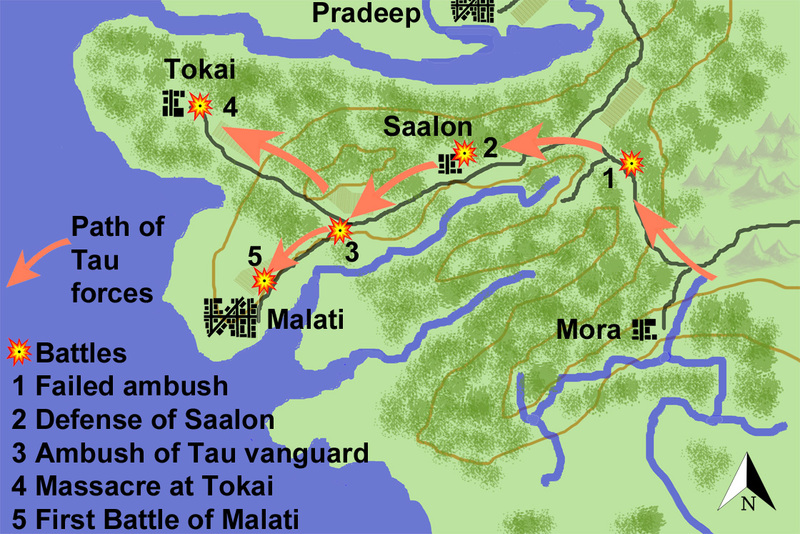 Once the Tau broke out of the Hanui Valley, they quickly swept through the lightly populated western forests and struck at Malati.The Hero of Dar Sai, Captain Stevrous Stark, managed to reinforce the city’s defenses and stymie the initial xeno attack, but after a stray artillery round put Stark out of action, a second xeno attack took the city. 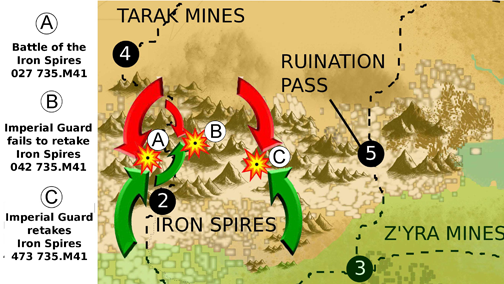 Despite this success, however, the Tau military deployment in the Hanui Valley was greater than expected, and months went by before Stark had gathered sufficient reinforcements to advance farther up the valley. On 3 244 735.M41, Stark launched a new campaign up the valley, with his target an enormous xeno-built structure heavily defended by the Tau. Although the battle initially went well for the Imperium, a late-afternoon (and desperate) counterattack by the Tau won the day, and the Battle of the White Tower ended with the xenos consolidating their hold on the valley. Almost immediately, the Tau went on the offensive. From 3 285-334 735.M41, the Tau swept across the forested western provinces of the main continent in a bid to seize the city of Malati (Tau march on Malati). That was followed some weeks later by a frontal assault on the city (First Battle of Malati) on 3 335.735.M41. Tau forces launched an attack on the city’s outer suburbs, with sweeping counterattacks on both flanks by Imperial forces. Fierce fighting ultimately ended in a stalemate, with Imperial forces holding the city and Tau forces a dangerous threat in the surrounding farmland. As the year came to a close, the Tau made one last effort to seize Malati. On 3 945 735.M41, the Tau launched a combined land and air attack on the weakest part of the city’s fortifications and broke through, ultimately forcing the Imperial army to evacuate and surrender the city. (Malati falls to Tau attack). Since this battle, there has been no significant military action—as both sides attempt to consolidate their forces for the next fight. There are rumors, however, that an attempt by Tau water caste diplomats to subvert the government of the Mora Plantation was thwarted by the Inquisition, which deployed stormtroopers and Space Marines (Knights of Altair) to drive away the xenos and execute traitorous government officials (Inquisition strikes at Mora). With the Blessed Ignorance unable to change course, Da Butcher strikes at its victim’s undefended stern. The naval balance in the Sculptor System was thrown into turmoil with the Imperial Disaster at Hegria, where the ork warlord, Kaptin’ Stompafist, landed fresh ork reinforcements on Hegira. His Kill Kroozer, Da Butcha, wiped out a six-ship flotilla single-handedly before disappearing. The battle was truly a disaster for the Imperial navy. The one silver lining of the engagement was, as Da Butcha was wiping out the last of the Imperial ships, a lucky weapons battery hit took out the bridge of Stompafist’s bridge and killed its talented ork commander. The loss of so many ships left Commodore Gadea Hennard with two few ships to safeguard the entire planetary system. With a Tau flotilla above Dar Sai—and Da Butcha still believed to be deployed somewhere near Hegira—Hennard needed to take action to regain the strategic initiative. As a result, he consolidated what ships he could—and took the fight to the Tau. In a solid victory (Tau navy rebuffed at Dar Sai), Hennard smashed the Tau flotilla, killing the xeno commander, Kor’el Dal’ta’ai, in the process, and gave the Imperial navy some hope of fulfilling its mission of protecting the Sculptor System. The superior tactical skill of the Tau navy proved itself in the Al’gel System. Although warfare is endemic across the galaxy, the only other significant military action in the Corvus Cluster did not involve an Imperial-held world. Alarmed by signs of a developing WAAAGH! in the ork-infested Al’gel System, the Tau pulled together a fleet under the command of Kor’o Che’lei (Admiral Lightning) to attack the growing xeno threat. Thus, on 6 680 735.M41, the Tau campaign against the orks began with a naval strike at the small but growing fleet of ork ships in orbit above Al’gel II (Tau crush ork fleet in Al’gel System). More than 80 percent of the ork fleet was destroyed, with a small number of ships fleeing to the system’s outer ring of space debris to regroup. Land operations on Al’gel II began on 6 687 735.M41, when Commander Broadsword led 500,000 Tau warriors in an aerial assault of the planet that quickly fell afoul of the orks’ insatiable enthusiasm for violence. 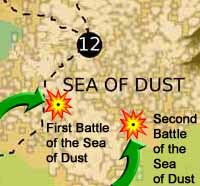 More than 2,000 fire warriors died on the first day of battle—three times original estimates—and the initial beachhead failed to come within 15 kilometers of any of the Tau’s first-day objectives. That left everywhere within the Tau perimeter vulnerable to ork artillery fire (Tau invasion of Al’gel III meets fierce resistance). 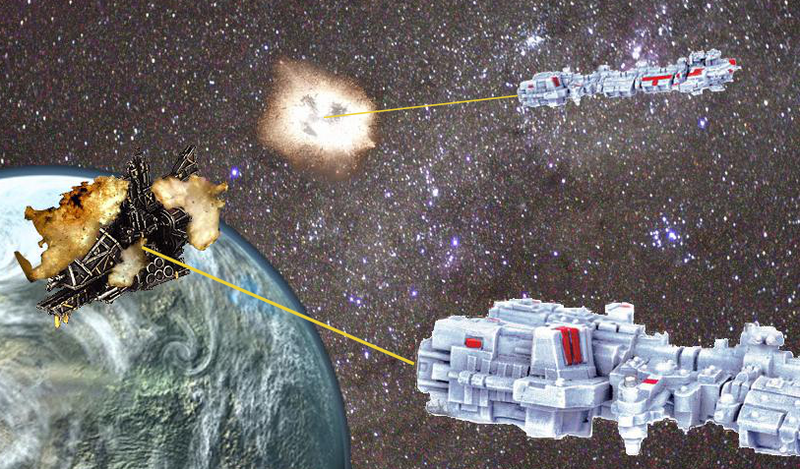 The Tau invasion’s fate now faces an uncertain future. 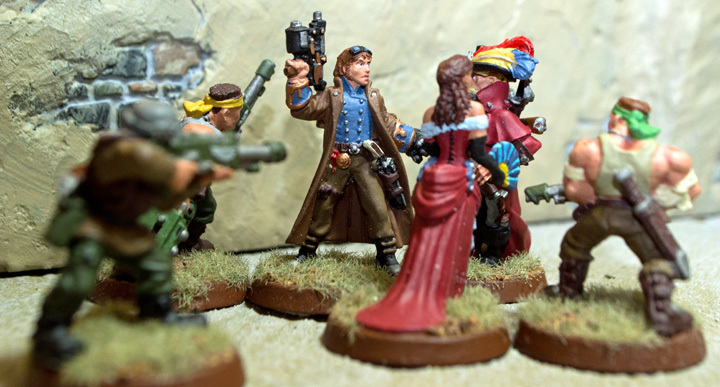 Rogue Trader Adeon Drake faces off against Count Feracci and Lady Adriana. Little more than a footnote in the grand scheme of events, two of the Sector’s more colorful individuals, Rogue Traders Adeon Drake and Count Johaan Feracci, engaged in a deadly battle of blades and blasters on the world of Morkai. Although Drake managed to make a sizable profit from his adventures, he ended the clash in a cell of the Adeptus Arbites (Ambush on Morkai). Soon released, Drake agreed to transport a rogue Adeptus Mechanicus explorator to the abandoned world of Stigmata, under quarantine due to fears by Imperial authorities that the ancient ruins on the planet were a potential threat. An attempt to enter one of the ruins awoke an ancient evil, and Drake was lucky to escape with his life (Pyramids of Stigmata: An Adeon Drake Adventure). Finally, several unauthorized expeditions are rumored to be under way to scavenge long-lost technology on the world of Prysmos in the Eudoxos System. It’s expected that more rumors of these expeditions’ successes (or failures) will circulate in the months ahead.